I was lucky to attend his classes few years ago,but unfortunately I couldn't continue the classes because of my busy schedule.He is a music god,he can play many instruments.He has a unique style of playing guitar. Born in 1942 in Badulla, a town located on the Eastern rim of the mountain country where the high mountains meet the plains. He lost his eyesight completely when he was five. As an 11-year-old boy, he started learning the flute and the tabla under Guru J. M. Amaranath, one of the most famous musicians of his time. For the next 14 years, in the mandapa of Guru Amaranath, Hemapala Perera gradually mastered five musical instruments: the flute, the tabla, the violin, the mandolin, and the guitar. At the age of 27, Hemapala Perera became known to the music world when he gave his spectacular performance before the music gurus from North India, earning much admiration and a "superior-grade artist" title to accompany him. His music, as the expression goes, became "the sweetest honey poured in to Sinhalese ears". 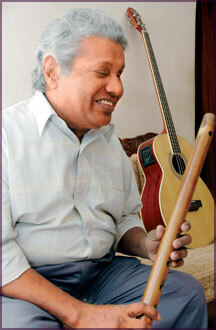 Hemapala Perera's extraordinary music talents together with the subtle knowledge his masters have passed on to him, have enabled him to tame the Western musical instruments such as the guitar and the mandolin, accommodating them to play North Indian classical music; from these, he developed a special love for the flute. Hemapala Perera has visited many foreign nations in carrying out his mission of entertaining and inspiring the world with Hindustani classical music. At present, he is engaged as a musician at the Sri Lankan National Radio and also serves as Visiting Counselor in the Institute of Aesthetic Studies of the University of Kelaniya, Sri Lanka. What is music from my personal point of view? The general view today is that music is substantially for entertainment - I have to disagree with this idea. To me, music is something going far beyond that conception-it is truly expansive and transcendental. While discussing these things, we must concentrate on the classical aspect of music, whether it be Occidental or Oriental-otherwise we'll find ourselves in an emptiness. Every human is inclined to one or another religious/philosophical observance, of which, whatsoever the brand name with which it is labelled, the ultimate goal is the same: spiritual attainment. Thus music is one such course that leads man to this particular goal-a way to heaven. Beyond the climax of classical music, it is nothing but redemption from the secular world. How do I differentiate Eastern from Western classical music? It is an unequivocal fact that man has a brain as well as a heart. In accordance with the Eastern view, held in Hindustani classical music, priority is given to mind (heart) from which music then spreads to the brain, while according to the Western point of view classical music spreads vice versa. However, irrespective of the order in which it happens, music does connect these polarities. I should also like to mention the fact that my main instrument is the bamboo flute. Unlike any other instrument which is a union of multiple craftsmanships, the distinctive feature of this flute is that it is the exact opposite of that. It is not an addition of parts together but a reduction of parts away from the natural piece of bamboo: it is something almost empty. But the superb characteristic of it is that it has the capacity to go hand in hand with any other developed modern instrument. Though very simple in its make, it includes all the techniques that any other instrument has, though it still has maintained its original state. It has the ability to stand climatic changes; it is easy to handle as well as transport and quite inexpensive in comparison with other instruments. How did music affect me personally? Well, let me give a brief comment: Music is my second eyesight!